For those looking for an economical alternative to dock boards, our dock plates may be just what you need. A Copperloy dock plate can be used in a variety of industries and applications. Furthermore, we offer an array of specifications and features to make sure you have the right material handling equipment for the job and made in the USA. Loading dock plates are used to bridge a gap from one area to another in material handling operation. Since the plate is a flat piece of metal with a slight bend for easy transition, it doesn’t have curbs. 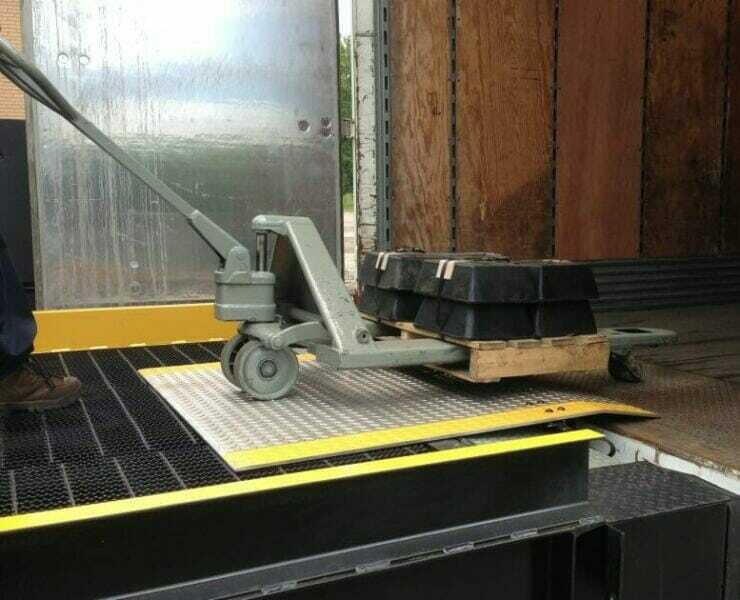 As a result, the lack of curbs makes them ideal for loading and unloading with dollies and pallet jacks. Consequently, they are also great for irregular or sharp turns, where a curb could get in the way. In addition to our standard dock plate, all of our dock plates for sale are available in special order configurations. Our in-house engineering team can custom manufacture a dock plate to any specification, size or requirement. Therefore, if you’re looking for a custom, dock board, or need a dock board made to unique specifications, just ask. Contact Copperloy today by filling out the form on the side. Aluminum dock plates have more flex but are the lightest weight and most affordable dock plate we have. Engineered to be lightweight, this is Coppelroy’s most portable dock plate. 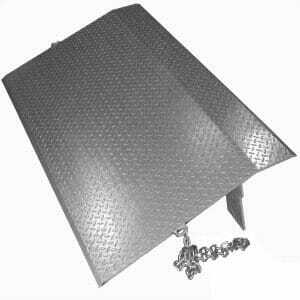 The Aluminum dock plate can handle capacities up to 12,500 pounds. Since they are not made to be used with forklifts, they are ideal to handle handcarts and lighter material handling equipment and freight. Though light, the aluminum plates still come with lift straps to help move and place them. Steel dock plates offer higher capacities but give up some of their portability as they weigh more than the aluminum dock plate. Some of the high-capacity, steel dock plates can accommodate forklifts, though load weight is important. Also, steel dock plates can handle capacities reaching up to 17,000 pounds and steel plates come with a one piece lift chain and make moving and positioning the plates very easy. Copperloy’s heavy duty dock plates are engineered with durability and efficiency in mind. As an industry leader in custom fabrication, only the finest of material are used. Pallet jacks, dollies, and carts work best with plates due to the capacity level. Copperloy plates are built to handle capacities between 1,000-14,000 lbs. In comparison, Copperloy manufactures dock boards. Dock board designs handle 10,000-15,000+ lbs. Instead of asking for a forklift dock plate, explore Copperloy Dock Boards. Dock boards are the superhero of the dock plate. Handle higher capacities and larger equipment. In comparison, forklifts and fork trucks can be used with dock boards. Also, these boards have curbs to prevent runoff and are available in steel or aluminum.